1 cup of mashed sweet potatoes contains 200 calories, 0 fat and ample fiber. They also contain vitamin C and A as well as minerals like potassium, manganese and iron. Sweet potatoes contain vitamin A and C which prevents premature aging and degenerative diseases. Sweet potatoes contain fiber which prevents constipation. 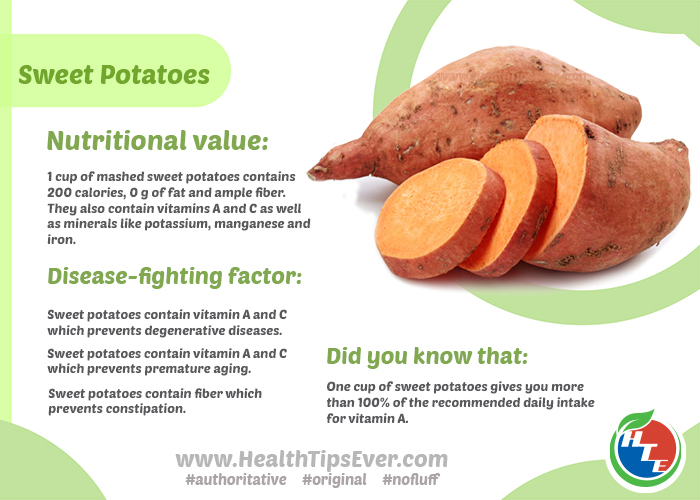 One cup of sweet potatoes gives you more than 100% of the recommended daily intake for vitamin A.